My parents didn’t buy me a set of alphabet blocks when I was a kid. They didn’t have to. I played with my mother’s set of blocks, blocks dating from the early 1930s. They were wonderful blocks. In addition to the ABC’s and the numbers, they had a red and yellow patterns on one side, train and circus puzzles on another, embossed pictures related to the blocks letter, and puzzles of important people in the community (the fireman, the policeman, the train conductor, the soldier, the sailor). The soldier was dressed in a World War I uniform, so I didn’t connect him to the images on the television in the early 1960s. I took it on faith that the sailor was important, even though there were very few sailors in south-central Montana. The paint was somewhat faded and the edges were worn, but I loved those blocks. Indeed, 50 years later, I still have them. While the new blocks available on the market are not quite as visually interesting and do not have the same range of play possibilities of those produced in the years just after the turn of the century (1900-1925), they are still an important part of childhood and provide a world of play and learning possibilities, not only for children, but for adults as well. Alphabet blocks were invented by John Locke (yeah…the English Enlightenment philosopher better known for political theory and philosophy) in 1683. In short, these puppies have been around a long time. Not quite as long as the United States, but pretty darn close. In the early 17th Century, Friedrich Wilhelm August Froebel (the great, great, great something of the American kindergarten movement), refined Locke’s idea, by imprinting the letters on carved wooden blocks. The blocks available from a variety of outlets (ours come from Melissa and Doug and Maple Landmarks) are the descendents of the blocks created by a fellow named S.L. Hill, of Brooklyn, New York, who came up with a method of printing multiple colors and embossing wood. He is primarily responsible for making alphabet blocks commercially feasible. In 2003, somewhat overdue, alphabet blocks were inducted into the Strong Museum’s National Toy Hall of Fame. 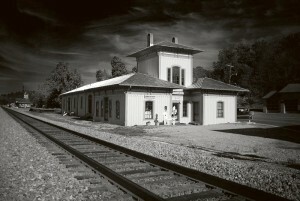 Perhaps it comes from being located in a 143 year old train station, but we believe in adaptive reuse. This extends to alphabet blocks. Under normal conditions, most folks set aside the alphabet blocks or sell them off at the first yard sale of the summer without thinking about their other uses. In an effort to give you the most bang for your buck and suggest some ways to incorporate those small wooden alphabet blocks in your family time, we would like to make some alternate suggestions. First, if your blocks did not come with a small canvas bag, pick up a small tote bag. Beyond paper, pencils or pens, and an egg timer, it is the only other item you will need for most of the following games. Object of the game: find as many words as possible in a set period of time (2 minutes, 5 minutes, etc.). Players need to agree on the timeframe before you start. Start by setting aside 5 vowel blocks. They will need to be placed face down and shuffled before each round. Go around the circle and have each player draw a block from the bag and set it face up on the table. The group will continue to draw until there are 14 blocks. The last two players will choose two of the vowel blocks and set them in the middle of the table with the other blocks. The blocks should form a 4 x 4 square. Set the egg timer to the agreed upon length of time and have at it. Each player writes down all of the words they can find using the 16 letters (14 consonants and 2 vowels). No letters can be used twice. The player with the longest list, wins the round. rather than rewarding the player with the longest list, give points to players who come up with words no one else found. rather than making individual lists, one player acts as a secretary for the round. Players yell (or say, in a well modulated voice) “word” and announce the word they have found. The secretary keeps track of the word list and who made the suggestion. At the end of the round, each player gets two points for every word they found. This variation adds a bit of mayhem to the proceedings and probably isn’t appropriate for more public settings (except, perhaps, schools, where mayhem is a typical part of the day). The game can also be played as a solitaire game, one very similar to those found in most Dell puzzle books. Required materials: blocks plus tote (may want to bring along the egg timer). Object: to create outlandish stories. Put the blocks in the tote. Agree on the length of each round (once around the circle, twice around the circle, or a given period of time). The first player chooses a block from the bag, chooses a side of the block as the “game side” and hands it to the player to his or her right. The second player must start a story, by creating a sentence using a verb and a noun starting with that letter. If the “game side” of the block is a picture, then the second player must use that word (horse, bee, barn, octopus) and a verb starting with the same letter. At the end of their sentence, the second player draws a block and hands it to the player to his or her right. The third player must provide the next sentence of the story, using a verb and noun on the block they were handed, and connecting it to the sentence provided by the player before them. The round continues until each player has had a turn or you have reached the agreed up length of time. Each player has to repeat all of the previous sentences before adding theirs. Rather than going in one direction, allow movement in both directions (handing the block right or left). If you are playing with a small child, let them pick the block and hand it to you. You make up the story. They continue to hand you blocks and you continue to add to the tale. ABC blocks are one of the world’s great storytelling tools. Object: to find interesting stuff out the window. This is a bit of a takeoff on the alphabet sign game. First, one of the parents or other adults in the car will have to play referee and block chooser. The referee chooses a block and a side and announces the letter, picture, or number to the other passengers. The first one to spot the letter (a Z), a number (4), or the specific object (a barn) gets a point and the players move on to the next block. The blocks add a random element to more traditional travel games. Require that the letter or number be part of a license plate or a roadside sign. Require that the images be found on a vehicle or a roadside sign. There are hundreds of variations, including drawing two or three blocks and requiring that the letters or numbers or images have to be found in the same location.